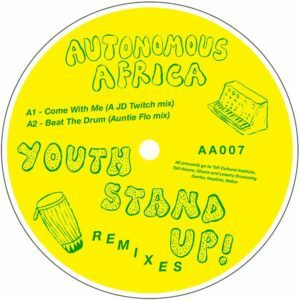 Four remixes from the Youth Stand Up! album that was released on Autonomous Africa late in 2015 by JD Twitch, Midland, Auntie Flo and General Ludd. Youth Stand Up! is a collaborative recording project between Glasgow’s Green Door Studio, Lebeha Drumming Center in Hopkins, Belize, and the Tafi Cultural Institute based in Tafi Atome, Ghana. All proceeds will go to Tafi Cultural Institute, Tafi Atome, Ghana and Lebeha Drumming Center, Hopkins, Belize.